Knife throwing is as much an art as it is a hobby due to the concentration, dedication, and expertise that it requires. 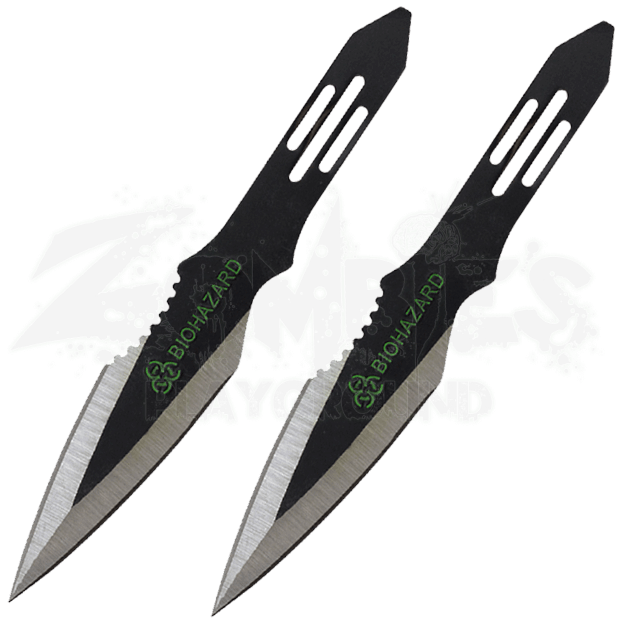 Now you can show off your awesome skill when you throw the 2 Piece Biohazard Asymmetrical Spear Throwing Knives! Paired with their traditional spear point blades, the asymmetrical design of these throwing knives offer an unconventional balance made to drive the knife forward to solidly embed the blade in its intended target, the linear cutouts on the handles adding to the weight distribution. The edges host the classic silver color while the rest of the knife holds a black finish, a bright green biohazard symbol sitting in the middle of each blade. When not in use, store this pair of survival gear in the durable nylon sheath that makes storing and carrying the knives fast, safe, and easy! 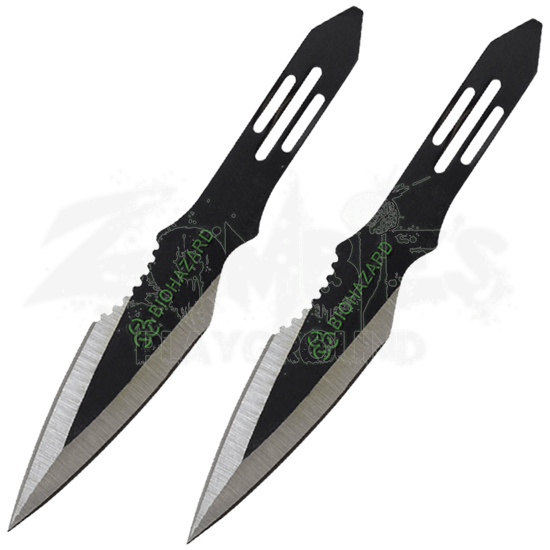 The zombie apocalypse, throwing competitions, and more will no longer stand in your way when you arm yourself with the 2 Piece Biohazard Asymmetrical Spear Throwing Knives, the ideal tools for the expert and novice survivor!